Canadian titles captured 3.1% of the overall domestic box office. This past year capped a remarkable ten years of impressive box office results for Canadian films, achieving an overall growth of 134%, which was six times higher than that of the overall market. Telefilm's contribution went further; an increased participation by the private sector and international partners allowed for more projects to be supported with less investment. Led by the Oscar-nominated films Incendies and Barney's Version, Telefilm-supported projects won 127 awards around the world. 1All box office receipts are supplied by the Motion Picture Theatre Associations of Canada (MPTAC) on a calendar year basis, from January 1 to December 31. The receipts of films having played in more than one calendar year are ascribed to the year in which they were earned. Total gross box office surpassed $1 billion for the second year in a row, and grew almost 3% from 2009 to 2010. However, the total gross box office for Canadian films dipped almost 4%. Source: MPTAC, figures are rounded. In the independent film market2, Canadian films in the English-language market are an exception with an increase of $5.3 million in box-office earnings in one year, a 78% increase. Foreign films in English saw a decrease of $19 million. In the French-language independent film market, Canadian films experienced a decrease of $6.6 million or close to 25% while foreign films retreated by $1.6 million or almost 8%. 2Films produced outside of major U.S. studios. Source: MPTAC, figures are rounded and box office is measured in current dollars. A look back over ten years of box office results provides an interesting perspective. Total box office has grown by 21.2% while independent film box office has increased about the same. However, Canadian film box office has surpassed both these categories with explosive growth of 134% – over six times higher than the overall market. Total gross box office for Canadian films was down by 3.9% in 2010 compared to 2009; one interesting statistic is the change in box office results by language. French-language box office dropped almost 25% while English-language box office rose over 75%. This statistic illustrates the huge impact that one extremely successful film can have on annual box office results. In 2009, De père en flic powered the French-language market with a $10.7M box office, while the highest-grossing French-language film of 2010 was Piché : Entre ciel et terre at $3.6M. The English-language market had the opposite experience. In 2010, Resident Evil: Afterlife grossed $6.9M while the highest take of 2009 was $3.0M for Trailer Park Boys: Countdown to Liquor Day. Considering both languages, the top four Canadian films earned almost half of the box office for all Canadian films in 2010. Again in 2010, American films dominated the market with an astounding 92.9% share. Total market share for Canadian films has hovered around 3% for each of the past four years. Within the independent film market, Canadian films can and do compete with a more robust 20% share. In fact, Canadian films in the French-language segment dominate the independent film market with a 50% share. Even in the English-language segment, Canadian films increased their market share substantially year-over-year – from 5.0% in 2009 to almost 10% in 2010. In the independent market, Canada managed to place two films in the top 10 grossing films for 2010, compared to only one in 2009. By number, Canadian films represented close to 20% of 467 new titles released in Canadian commercial theatres in 2010, and occupied 5.5% of Canadian screens. Out of 92 Canadian films released in 2010, the CFFF contributed financial production support to 53. CFFF-supported films released in 2010 accounted for 71% of total Canadian box office. According to Tony Gunnarson, "digital delivery has proven to be a game-changer in the entertainment arts. Ten years ago, consumers worldwide spent roughly the same amount on music and video across all platforms and formats. Since then, the traditional music industry business model has been revolutionized by the shift from physical formats to digital delivery." 3 Independent artists now have direct access to their consumers and can completely bypass the traditional recording industry model. That same shift to digital delivery is gathering momentum in the audiovisual industry. Consumer spending on video was still 88% physical in 2010, but several viable alternatives exist. Premium video-on-demand (VOD) services recently launched by the big studios can showcase feature films in homes just 60 days after their theatrical release, reducing the cinema window by half and undermining the DVD market. The market has been simultaneously exploiting alternative distribution channels like Netflix and Redbox. These new service models underscore the industry's challenge to distribute content profitably online. But that's not the only challenge. Effectively tracking online consumption habits has become complex given the fragmentation of downloading and streaming options – legal and otherwise. This is a challenge that affects both Telefilm and the industry. How can success be accurately measured across all of these platforms? Over the past decade, Telefilm has tracked commercial indicators such as box office receipts, revenues and sales. However, a well-rounded view of success also includes other cultural and industry indicators. This is one of the driving forces behind Telefilm's plan to develop a broader measure of success for the Canadian audiovisual industry. Canadian moviegoers appreciate a wide range of film genres and their preferences show in the way they spend their money. 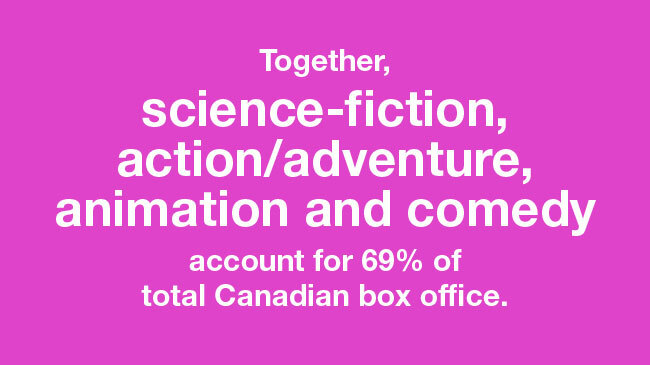 Together, science-fiction, action/adventure, animation and comedy account for 69% of total Canadian box office. To meet this market demand for diversity, movie theatres provide their audiences with a wide variety of film genres. 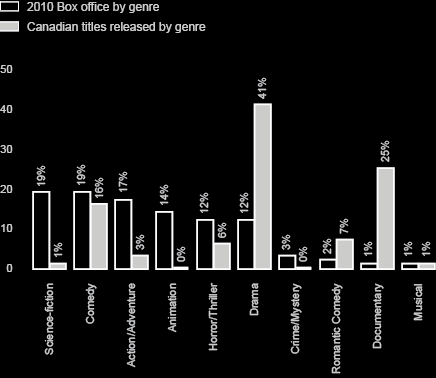 Historically, as is also highlighted in the above table, Canadian filmmakers have produced two dominant genres – drama and documentary. Still, it is clear that box office success in 2010 of genre films such as Splice and Les Sept jours du talion demonstrates the high level of interest of Canadian viewers and the potential for success in reaching those audiences. That is why portfolio diversification is an important objective of the organization for moving toward a better alignment with Canadians' preferences. Statistics show that from 2001 to 2009, Hollywood films' share of the Canadian box office was 89%. Canada's audiovisual industry produces world-class content but must continue to make adjustments to enter the next major phase of its development. The industry must balance its historic focus on production with an equally robust approach to ensuring that its productions stimulate audience demand. Telefilm and the industry are in agreement on this point. Telefilm's new corporate plan makes stimulating audience demand a priority. Telefilm intends to focus a significant part of its energy on promoting Canadian talent and products through various events and distribution channels, ensuring the presence of Canadian content on all platforms. When Canadians go to the movies, they most often choose to see science-fiction, action/adventure, animation or comedy. Telefilm and our clients are working to build audiences by expanding the range of genres to more accurately match consumer preferences. Telefilm has increased support for different genres, such as Westerns, musicals and romantic comedies. Action/adventure and comedy are on the rise, especially in the French-language market. 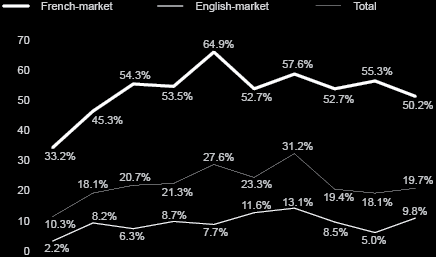 In 2010-2011, dramas received an almost 57% share of funding for both linguistic markets. Comedy and horror/thriller also took a significant share of English-language films, while comedy captured almost a third of all French-language films. Mystery/crime/police also received some new support in the French-language industry. We are also working with the industry to achieve greater diversification in the project pipeline. That is why we invest in specialized training such as Telefilm Canada Features Comedy Lab. The Telefilm Canada Features Comedy Lab is a Canadian Film Centre program first launched in 2009, and presented in collaboration with Just For Laughs. Chaired by internationally acclaimed comedic actor Eugene Levy, the Comedy Lab aims to develop Canadian comedies that are critically acclaimed and commercially successful. The three-month course takes experienced Canadian feature film producers, their writer/director teams and comedy scripts, and pairs them with the best comedic minds in the world. The creatively rich inaugural comedy lab in 2009 has resulted in the making of Servitude from Buck Productions and Victory Man Productions, to be released in Canada by Maple Pictures. The audience appeal of multicultural storytelling is undeniable. 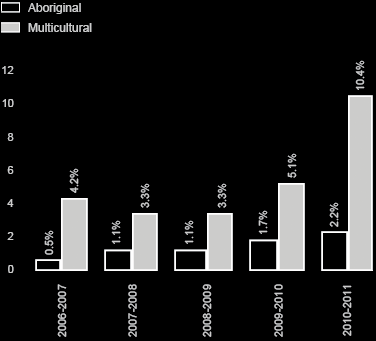 In 2010-2011, Telefilm committed over 10% of all funding to multicultural and Aboriginal projects. That includes $0.4M in development funding to 22 Aboriginal projects across Canada, an amount roughly the same as 2009-2010. Telefilm also funded 34 projects with strong multicultural elements. The 11th edition of ReelWorld Film Festival that showcases international works reflecting positive images from the Aboriginal, Asian, Black, Latino, Middle Eastern, South Asian and other communities. In 2011, two-thirds of the films screened at the festival were Canadian. Deepa Mehta's next feature film based on Salman Rushdie's international bestseller Midnight's Children. Breakaway, a Rob Lieberman film with Rob Lowe, Russell Peters and up and coming Canadian actor Vinay Virmani, is about a young man who defies his Sikh father by casting aside religious traditions to pursue his dream of playing professional hockey. Lost Journey, directed by Ant Horasanli, presents the story of a young Iranian man who grapples with cultural assimilation in Toronto. Another important element reflecting diversity is language. In 2010-2011, Telefilm's support of French-language projects and events outside Quebec returned to normal levels. Before 2008-2009, these commitments also included funding from the Department of Canadian Heritage through its Interdepartmental Partnership with the Official-Language Communities program. This year also marked the production of Canada's first Franco-Ontarian comedy. La Sacrée, written by Daniel Marchildon and directed by Dominic Desjardins, is the first French-language feature financed by Telefilm through the Official-Languages Activities Programs' Écrire au long and the production component initiatives. The film is scheduled for release in the fall of 2011. 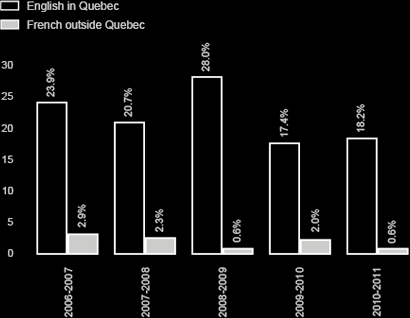 Commitments to English-language projects and initiatives inside Quebec rose slightly in 2010-2011. Diversification is also about regional stories. Each year, Telefilm invests in some fifty films at the production stage of which only about ten represent investments above $1.5M per film. These investments are the result of a rigorous selection process that puts in competition the very best projects from all regions of Canada. With such a small number of films accounting for a significant portion of investments made by Telefilm, the regional breakdown of Telefilm's investments will fluctuate considerably from year to year. Although Quebec has remained the province with the most production commitments (some English-language and almost 100% of French-language productions) over the last five years, Ontario has steadily built its share to near parity in 2010-2011. A strong performance in Ontario is attributed to ten productions last fiscal year, which received $1M+ in Telefilm support. 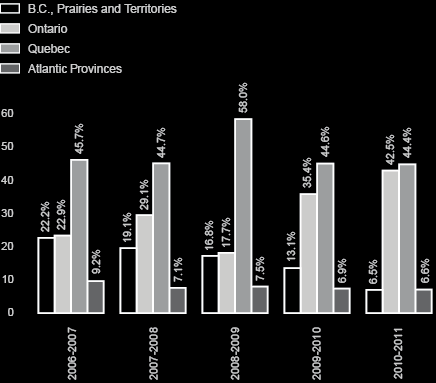 As indicated in the graph above, B.C., the Prairies and the Territories saw their share of total financing drop over the past five years. This decrease is explained by the investment in seven films from these regions over the first three years of this five-year period compared to only one over the last two years. Funding from other government sources, including provincial tax credits and agencies, has been stable over the past five years with very slight fluctuations, representing between 32% and 35% of total financing. Roughly a third of Telefilm's total commitments go to French-language productions. Over the past five years, dollars for English-language productions have tended to be concentrated in Ontario. Ontario has been receiving more commitments mainly because its client base is large, and also because many big-budget projects have been coming from Ontario over the past five years – including those produced by companies with performance envelopes. Incendies and Barney's Version received 52 awards and prizes in 18 festivals and events. 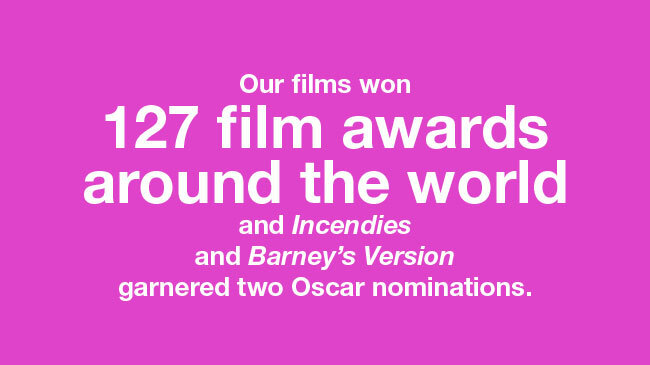 Incendies and Barney's Version were nominated at the Oscars®, joining nine other Oscar-nominated, CFFF-supported projects since 2006-2007. Xavier Dolan was nominated for a César Award (Best Foreign Film) for Les amours imaginaires. ZedCrew, directed by Noah Pink, was presented in the 42nd Directors' Fortnight. Xavier Dolan's second feature film Les amours imaginaires was presented at the Official Selection in the Un Certain Regard category. Guy Maddin at the Berlin International Film Festival. Atom Egoyan, Director and President of the Cinéfondation and Short Film Jury at Cannes. Special screenings of Gunless, Incendies, and Barney's Version in Ottawa, and Afghan Luke in Halifax gave Telefilm an opportunity to promote the successes of our filmmakers to parliamentarians and Canadian audiences. The screenings also delivered a message to the private sector about financing and partnering with successful Canadian filmmakers. The Child Prodigy, a film written and directed by Luc Dionne, was also screened in Shanghai during Expo 2010. Trailer Park Boys: Countdown to Liquor Day received the Golden Box Office Award. De père en flic received the Guichet d'or. These awards shine a light on Canada's commercial successes in feature film, and associate Telefilm with box office achievement in the industry.